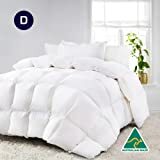 SOFT & COMFORTABLE: Features 100% premium cotton cover, which is mite and mould-resistant, skin-friendly, and non-toxic, with 700GSM heavy weight non-live plucked duck feathers and down filling for the ultimate in softness, fluffiness, breathability and comfort. 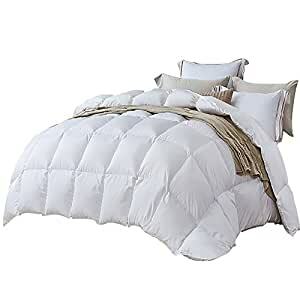 LOCK-IN WARMTH: Square stitching with baffle box design for always preventing the duck feathers and down filling penetrating from sides and lock-in its warmth all night long. EXQUISITE SEWING: Comes with double-stitched edges for all-round protection of the filling from time to time and to enhance its durability as well. EASY CARE: Line dry available. Please note: no machine wash, no bleach, no iron, no tumble dry, no dry clean.EASY CARE: Dryclean-able. Please note: do not wash, do not bleach, do not iron, do not tumble dry. SIZE & WARRANTY: Double size: 180 x 210cm; We cover 5-YEAR warranty and provide a customized and professional customer service before and after your purchase; please feel free to contact us if you have any trouble with this item. 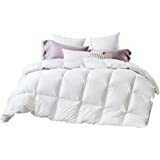 Indulge in luxury comfort with our finely constructed Giselle Bedding Duck Down Feather Quilt. 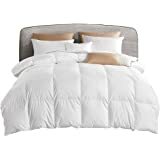 It’s the perfect quilt to provide you with seasonal comfort and a great feeling at all times. 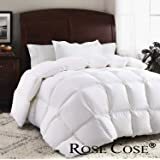 So don’t let the cold get to you and your family and snuggle up to the Giselle Bedding Duck Down Feather Quilt for a good sleep every night. 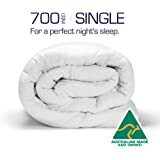 Available in single, double, queen, king and super king sizes. Order yours today. 5.0 out of 5 starsBest value ever! I didn't really expect much given the price of this quilt.. BUT.. I am sooo impressed!! Its probably the best quilt I have ever owned. I absolutely love this quilt and still cannot believe how little I paid for it.